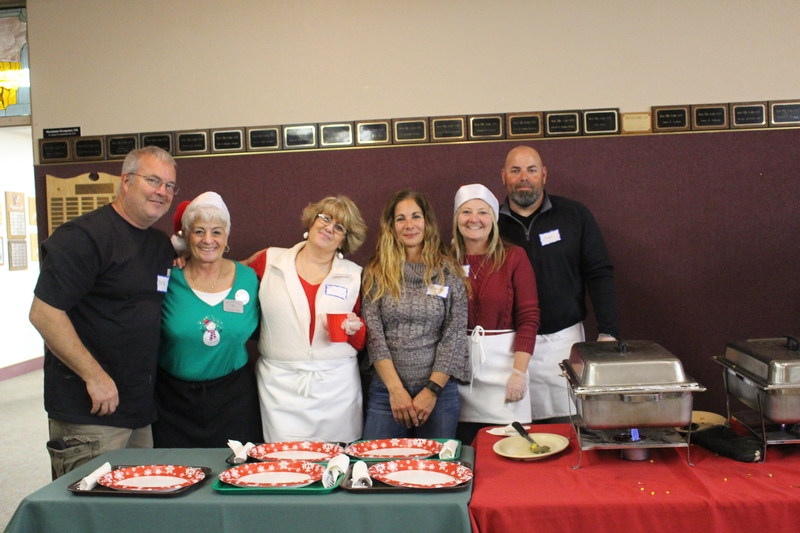 ST. GEORGE — The Dixie Elks Lodge in St. George bustled with activity as Christmas dinner was served to nearly 400 people with the help of more than 120 volunteers that made the holidays a little merrier for those in need. The dining hall at the lodge, 630 W. 1250 North, began filling with people as doors opened at 11:30 a.m. Christmas Day. It was the second Christmas the dinner was held by the Community Soup Kitchen of Grace Episcopal Church, where it was held last year, and Switchpoint Community Resource Center. The Benevolent and Protective Order of Elks Lodge No. 1743 provided the venue along with many others that helped make it possible. Members of Grace Community Church and several wards of The Church of Jesus Christ of Latter-day Saints, Bikers Against Child Abuse, Toys for Tots, Habitat for Humanity, Utah Non-Profit Association, the Utah Food Bank, Switchpoint, Adidas, the Bishop’s Storehouse, Dixie State University’s cello group and others all provided time, materials or donations. 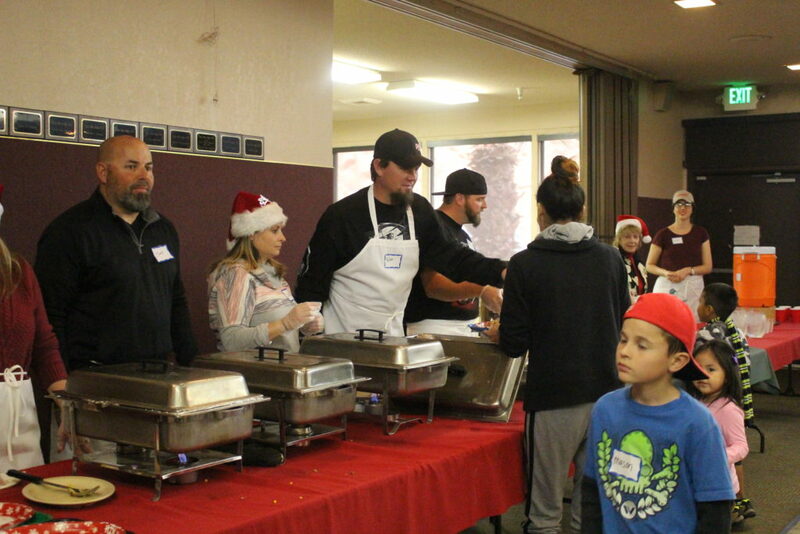 More than 120 volunteers served hundreds the meal, Sunday, that had been one week in the making, Nick Bujanovich, with the Community Soup Kitchen, said. “We really have to thank the Elks for being a very, very wonderful sponsor,” he said. 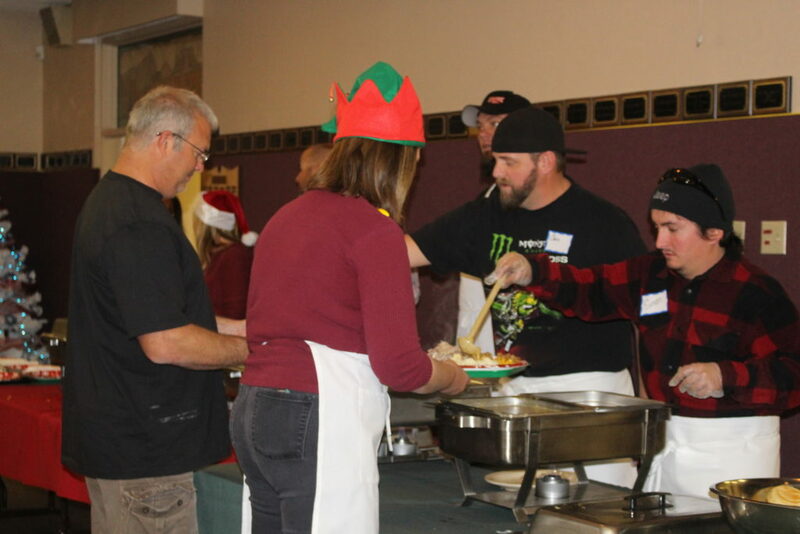 Volunteers filled each plate with turkey, ham, stuffing, vegetables and holiday fare. 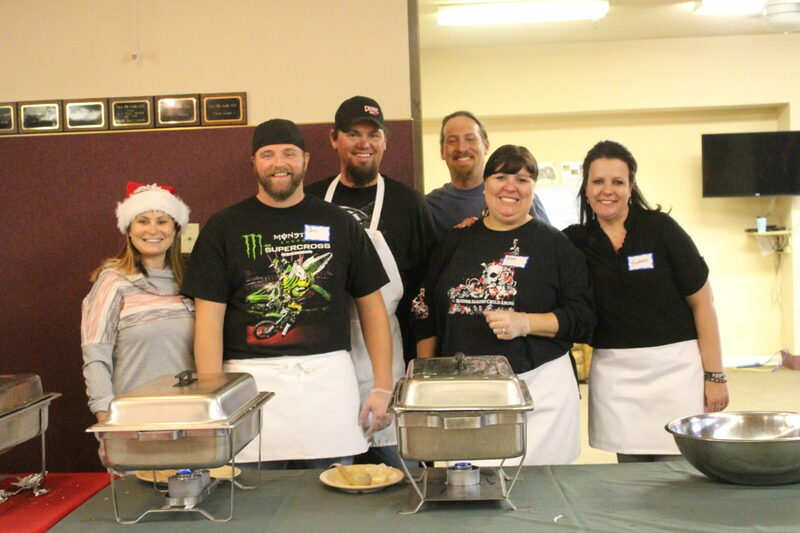 Haley Norman was visiting from Wyoming to be with family in St. George for the holidays and decided to spend part the day volunteering at the dinner and helping the homeless on Christmas. “It’s been awesome, and we’ve loved it,” Norman said. Elks member Donna MacBean was instrumental in creating a team a few years ago that was capable of cooking a holiday meal for hundreds of people. This was her second year coordinating, cooking and serving with the help of Elks volunteers. For MacBean, it’s her passion, she said. “We had about 100 volunteers show up today who gave up part of their Christmas to make someone else’s wonderful,” MacBean said. Gifts were also provided during the event, including toys for the children donated by Toys for Tots, gifts for women provided by Grace Episcopal Church, and gifts for men by the Community Soup Kitchen partners. Adidas donated a number of items, Bujanovich said, including 1,000 pairs of men’s socks and underwear for Christmas gifts; 150 backpacks that will later be filled with school supplies and given to the Washington County School District for underprivileged children; and 100 duffel bags that will be taken to Switchpoint and given out to the homeless so they have something to carry their belongings in. Justin Lefevre, who prefers to be called Twist, is part of Bikers Against Child Abuse. 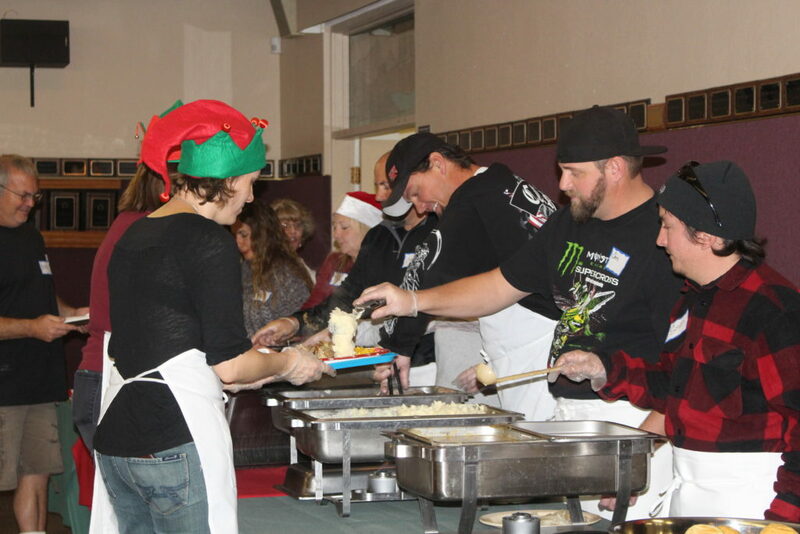 He and his wife, known as Cash, and other BACA members helped serve the meal. Twist said he learned of the event while attending a meeting at the Elks Lodge in 2015; this was the second year his family has volunteered. The Community Soup Kitchen prepares 120 hot meals a day, Monday through Friday from 11:45 a.m-1 p.m. at Grace Episcopal Church, 1072 E. 900 South, St. George. It is a service of the church, Switchpoint and receives support and volunteers from other area churches and organizations. “So we have the ability to help a lot of different people across the community,” Bujanovich said. The kitchen serves homeless, working poor, families with children and even many seniors in the community that either live alone or have minimal social interaction, Bujanovich said. All are welcome to come by and eat a hot meal. According to data retrieved from The Utah Food Bank, more than 400,000 Utahns, or roughly 1 in 7, are at risk of missing a meal each day, and 1 in 5 Utah children are at risk as well. In the U.S., 48 million Americans, including 13 million children, live in households where a lack of means prevents them from getting the nutrition they need. Something a lot of folks seem to put out of mind is that all the poor, needy, hungry and desperate people don’t just go away after the holidays end. The year-round soup kitchen volunteers probly know this all too well. You people served free food, convention center , a homeless guy walked in ocean buffet and they fed him. Some weekends when Switchpoint is closed they have no food and CHRISTMAS weekend thrust got 3-4 meals. It’s do gard when I see homeless people begging on th weekend and there is no help..
To all the volunteers…Merry Christmas.